Brooks Robinson, the all-time leader in career putouts by a third baseman. In baseball statistics, a putout (denoted by PO or fly out when appropriate) is given to a defensive player who records an out by a Tagging a runner with the ball when he is not touching a base (a tagout), catching a batted or thrown ball and tagging a base to put out a batter or runner (a Force out), catching a thrown ball and tagging a base to record an out on an appeal play, catching a third strike (a strikeout), catching a batted ball on the fly (a flyout), or being positioned closest to a runner called out for interference. A third baseman, abbreviated 3B, is the player in baseball whose responsibility is to defend the area nearest to third base — the third of four bases a baserunner must touch in succession to score a run. In the scoring system used to record defensive plays, the third baseman is assigned the number '5'. 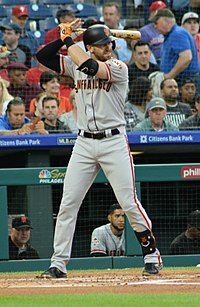 The third baseman requires good reflexes in reacting to batted balls, as he or she is often the closest infielder (roughly 90–120 feet) to the batter. The third base position requires a strong and accurate arm, as the third baseman often makes long throws to first base. The third baseman sometimes must throw quickly to second base in time to start a double play. The third baseman must also field fly balls in fair and foul territory. 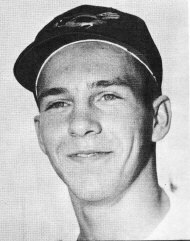 Brooks Robinson is the all-time leader in career putouts as a third baseman with 2,697. Robinson is the only third baseman with more than 2,500 career putouts. Rank Rank amongst leaders in career putouts. A blank field indicates a tie. Player (2019 POs) Number of recorded putouts during the 2019 Major League Baseball season. PO as 3B Total career putouts as a third baseman. Evan Longoria, the active leader in putouts as a third baseman and tied for 77th all time. Stats updated as of April 18, 2019. ^ A player is considered inactive if he has announced his retirement or not played for a full season. This page was last edited on 20 April 2019, at 08:40 (UTC).